Deep “froiled” lionfish is now one of the first things I’ll associate with Cape Canaveral. A biological neon danger sign should flash red over lionfish in the wild. Their colors are a stunning chocolate and cream. At the first hint of a challenge, their wide fins snap open, poisonous barbs ready to inject a debilitating neurotoxin into anything with penetrable skin. These proud, little leopard porcupines of the sea are also an invasive nuisance. Tropical saltwater reefs are overtaken by lionfish and native fish species quickly die out. Without biological diversity, reefs may go dormant and die off completely as lionfish flourish and move farther north to more populated waters. 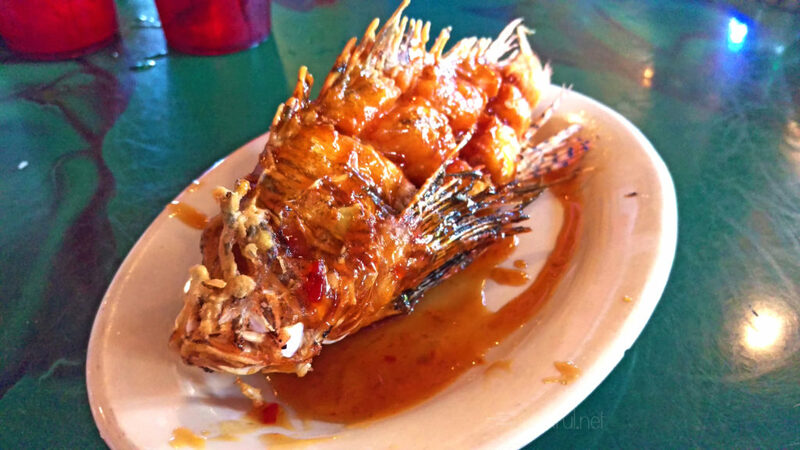 At Grills, the only good lionfish is on a plate. Our waitress rattled off the specials of the day when we stopped her—lionfish? The poisonous, pokey fish? My coworkers and I were skeptical. She explained all their catches come in everyday, especially the lionfish, since fishermen do as much as they can to stop lionfish from threatening the local marine ecosystem. The lionfish’s poisonous barbs are clipped and the fish is broiled until tender. Then, the fish is seasoned and deep fried until crispy golden. Finally, the fish is tossed in a tangy sauce and served with freshly sliced lemons. Fork and knife are optional. She had me at broiled. This picture does nothing to convey the actual, toasty majesty of this lionfish. One of the ways I attacked this plate was the cheeks. Fried, flaky little morsels. Then, the honor of the tail went to one of my co-workers. He later gifted me with his Florida red snapper’s tail in mutual respect and friendship. In about 15 minutes, the only thing left of my lionfish were a few back and head bits. Basically everything on this fish was a joy to munch on. Are you in town and embarking or dissembarking? Taking selfies with satellites? Eat a lionfish, save native marine life. Wow… That looks so sumptuous! Yum! 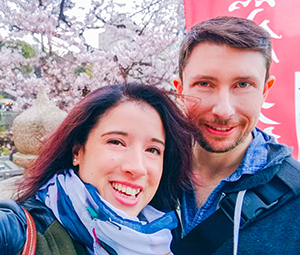 Join Marilyn and Adam as they explore Salt Lake City and the world by the forkful.